Poll: Who do you want to see as Tánaiste? Simon Coveney and Heather Humphreys are seen as the frontrunners for the position. 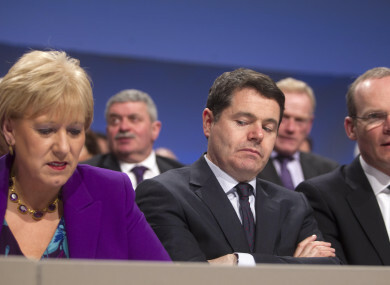 Heather Humphreys, Paschal Donohoe and Simon Coveney are all in the running. TODAY, TAOISEACH LEO Varadkar will announce the successor to Frances Fitzgerald as Tánaiste today. Minister for Foreign Affairs Simon Coveney is odds on with the bookies to take the title, having ran a leadership contest against Varadkar earlier in the year. Another name being floated is Minister for Culture, Heritage and the Gaeltacht Heather Humphreys, who is currently second favourite to get the nod. Education Minister Richard Bruton and Finance Minister Paschal Donohoe are also in the running. So, today we’re asking: Who do you want to see as Tánaiste? Email “Poll: Who do you want to see as Tánaiste?”. Feedback on “Poll: Who do you want to see as Tánaiste?”.